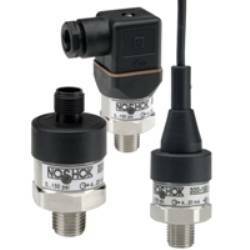 Noshok’s 300 Series compact-sized pressure transducer delivers long term stability during operation, and is ideal for use in general industrial applications where space is limited and durability is essential. This transducer is excellent for use in dynamic or static measurement, in applications including hydraulic and pneumatic systems, pumps and compressors, stamping and forming presses, test equipment and systems, and industrial machinery and machine tools. The NOSHOK 300 Series Transducer’s rugged, high quality stainless steel construction makes it compatible with chemically aggressive media, and highly resistant to shock and vibration. The sensor is welded directly to the process connection, eliminating the need for any gaskets or seals while also increasing its resistance to mechanical stress. A wide variety of electrical and mechanical connections are available for easy installation into most applications along with most popular analog output signals. All electrical components carry a high degree of EMC protection compliant with EN 61 326 which make it ideal for areas where RFI, EMI or ESD signals are present. The 300 Series Transducer is available in pressure ranges from 0 kPa to 100 kPa, and 0 kPa to 70 mPa, as well as standard absolute ranges from 100 kPa absolute to 1400 kPa absolute.